Tolls are in and cigarette taxes are out if Governor Holcomb gets his way in a final road funding bill. 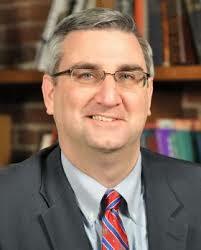 Holcomb is offering his most specific ideas so far on the final shape of a road funding plan. He says the cost of building and maintaining roads should fall on those who drive on them, and says provisions in both the House and Senate bills calling for the state to apply for federal tolling approval probably have to be part of a final plan. Neither the House nor the Senate package reaches the one-point-two-billion dollars a year the state says it needs in order to fully fund roads, but Holcomb says their combinations of gas taxes and tire and vehicle fees would be enough to pay for road maintenance for the next 20 years. He says in six or seven years, the state will have to take "a hard look" at imposing tolls to raise money for new construction. But he says he doesn't want tolls on urban bypasses -- he's thinking more of truckers going state line to state line. Hopefully the legislature and the Governor will come to their collective senses and not inflict toll roads on Hoosiers. I'm confident that most drivers loathe tolls and would rather pay for roads through taxes. Personally I cannot imagine ever voting for a politician who imposed tolls on Indiana highways. I wonder if Holcomb has seen what the on-ramp from I-94 eastbound entering the Indiana Toll Road eastbound at Portage looks like. I drove that this past Friday headed to Warsaw, Fort Wayne, and then on to Indianapolis, and most of the alleys on the near east side of Indy are better shape than that entrance ramp. Why should only Indiana residents pay for roads used to ship goods into multiple states? Why shouldn't this be a "collective" effort? Being the Crossroads of America is nice. I'm sure it is why we've had the growth in warehouse facilities in the metro area. That being said, transport companies will pass the cost onto the business selling the goods. The business will past the cost onto the consumer. However, those consumers will be people all over the country. Even though I use the interstate for work, I'd much rather we toll at least I-70 and I-65 instead of forcing just Indiana taxpayers to carry the burden. The bulk of the damage to highways is caused by semi-trucks and their trailers to destinations outside of Indiana. What makes you think only Indiana residents pay for roads? The gas tax is already a user fee that hits out-of-state companies that ship goods through Indiana. If we need more money for roads, raise that. Don't toll roads.